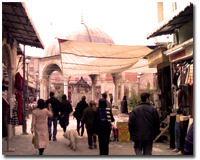 Turkey – Kemeraltı is İzmir’s historic market (bazaar) district. It was originally formed around the street surrounding the shallow inner bay of the city, which was filled in due course during the 17th century, availing the bazaar to be extended to a wider area. The street, that traces a wide curve and called today as Anafartalar Street (Caddesi), and known historically as the Street of the Mevlevis, in reference to the presence of a “dergah” situated by the street, constitutes the principal axis of Kemeraltı. The district covers a vast area extending from the level of the Agora of Smyrna (the quarters of Namazgah, Mezarlıkbaşı and İkiçeşmelik), to the seashore along the Konak Square. It remains one of the liveliest parts of İzmir. The first step that paved the way for the emergence of the present-day Kemeraltı area was the building in 1592 of Hisar Mosque. It is the oldest and one of the most significant Ottoman landmarks in İzmir, although built by Aydınoğlu Yakup Bey, a descendant of the dynasty that had founded the Beylik of the same name (Aydınoğlu) which had controlled İzmir prior to the Ottoman conquest. The name of the mosque, which means “fortress”, makes reference to the Genoese castle of “San Pietro”, previously called Neon Kastron in Byzantine times, part of which used to stand on the same location and which gradually disappeared in whole with the construction of new buildings on its spot. The final remains of the castle were cleared up during the construction of new port installations between 1867-1876. The court of the 1744-built Kızlarağası Han (caravanserai), with 1592-built Hisar Mosque in the background, in Kemeraltı, Konak, İzmir. 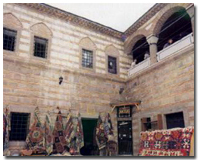 The caravanserai is a cultural center and a touristic attraction today. The market itself came into existence with the filling between 1650-1670 of the shallowest parts of the inner bay. The process of gaining ground from the bay was pursued in 1744 with the construction of Kızlarağası Han, a still-standing impressive caravanserai that emerged as the nucleus of the market, together with two older “hans”, the term implying a caravanserai with more markedly urban characteristics, that could not reach our day. These were the “Great Vezir Han” constructed by the 17th century grand vizier Köprülü Fazıl Ahmed Pasha, and the neighboring “Little Vezir Han” constructed by his successor Merzifonlu Kara Mustafa Pasha. Another historically important and no longer existing one was “Cezayir Han” (literally “Han of Algiers”), from where western Anatolia’s excess labor force had been annually dispatched to the Ottoman protectorate of Algiers for centuries. In fact, among the hundred odd “hans” Kemeraltı counted until the beginning of the 20th century, clearly visible on a 1905 map drawn by French cartographers on behalf of international insurance companies, only a dozen remains, in full or in part, while most was destroyed during the 1922 Great Fire of Smyrna or afterwards. The remaining part of the inner bay being allowed to silt up progressively throughout the 18th century, the shoreline facing Kemeraltı took its present straight form in the beginning of the 19th, although some of the land along the berth remained unused until the end of that century. In 1829, Sarı Kışla, the Yellow Casern, the principal Ottoman casern of the city, gigantic for its time, was built at immediate sea-side, and a private residence (konak) situated slightly diagonally behind the casern was extended and converted into the governor’s mansion, demarcating Konak Square that holds its name from the mansion, and which in its turn gave the name to the central metropolitan district of İzmir (Konak) and at the level of which Kemeraltı is considered to start. The governor’s mansion still stands, although the Yellow Casern was demolished in 1955 under express instructions from the then Prime Minister Adnan Menderes, who wanted to see Konak Square re-shaped, to the ongoing regret of many Smyrniots who had come to adopt the oversize building as one of the main landmarks of their city.